This week, the U.S. House and Senate approved bipartisan legislation to reauthorize the Carl D. Perkins Career and Technical Education Act. President Trump will soon sign into law the Strengthening Career and Technical Education for the 21st Century Act. The Perkins Act was last authorized in 2006. Since that time, the employment marketplace and career paths have changed dramatically. Health care, information technology, and many other cutting- edge fields have growing demands for well-educated and trained workers. Wyoming’s Senator Enzi, a longtime proponent of the Perkins Act and CTE, was a key leader in the development and passage of the final legislation. In the coming days our team at WDE looks forward to unpacking the tenets of the new Perkins Act and aligning them with our priorities, practices, and goals for CTE. 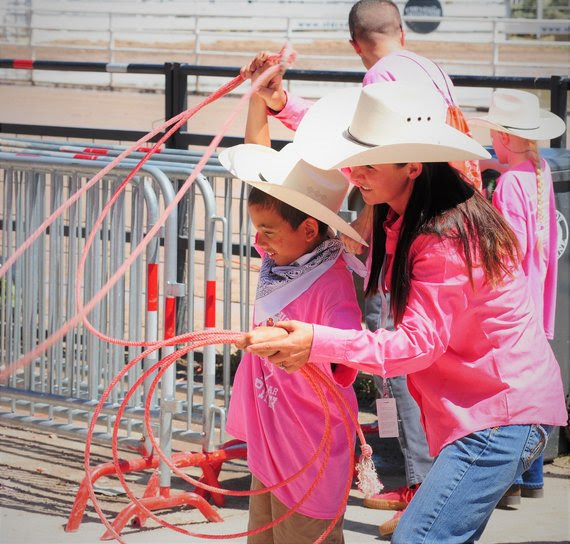 Wyoming’s Teacher of the Year, Sara Reed, helps Challenge Rodeo participants during Cheyenne Frontier Days. For the second year, CFD honored teachers and treated the Wyoming Teacher of the Year to VIP events.